BloomNet came to Drupal Connect in 2016 looking for a solution to an enduring problem. They had been at the mercy of their website, and so were their users. 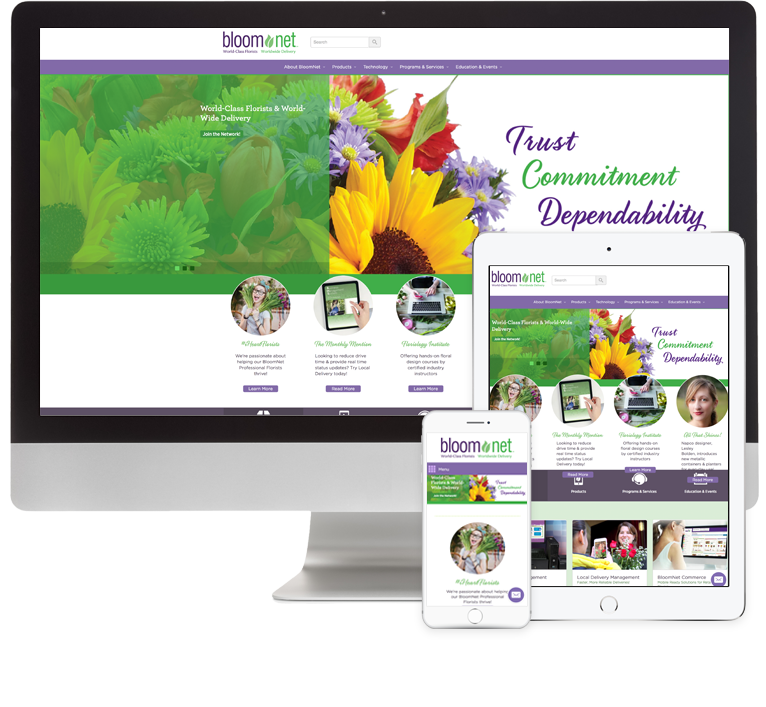 Drupal Connect provided needed changes to the theme so that BloomNet could communicate unencumbered with their customers. BloomNet had a loyal audience based largely on their reputation and contributions to training florists, but the full value of the company and its involvement within the floral community was muzzled by its dysfunctional website. Site editors had little control over how their content was displayed and that prevented BloomNet from taking advantage of their expanding online presence. The sites's appearance and layout did not take advantage of modern web standards. The user experience was poor and mobile devices rendered the site near unusable. As an international floral wire service provider owned by 1.800.flowers.com. Bloomnet sought an update to their site that would improve the aesthetics while also increasing their content editors' to make changes from the back-end. Re-theming was the easy part, giving content editors the power they needed to control the site without extensive developer involvement was a bit more difficult. BloomNet not only supports florists in the United States, but over 150 countries. Not only that, BloomNet supports advertising within their own directory to assist florists with selecting qualified partners around the globe. With their understanding of the floral industry, they also offer technology packages to their partners like tablet apps, credit card processing, business management, Constant Contact email marketing, and a commerce platform. With an expansive product line ranging from gourmet gift baskets to edible fruit arrangements, BloomNet allows its florists to expand their businesses with products their clients demand. Flexibility in content was almost always a trade until the Paragraph module. Using the Paragraph module, Drupal Connect's expert development team was able to hand complex content control back to BloomNet's content creators. It is now simple for BloomNet to update content on the site, while achieving the look and layout that communicates their message most effectively. Using the Paragraphs module to layout items, Display Suite as its foundation, and the Entityqueue module for assortment and arrangement, BloomNet was given the freedom of flexibility, organization, and functionality with a user experience to communicate brand value. Initially BloomNet came to Drupal Connect with a raw set of features and fixes. Drupal Connect's development team got to work uncovering all the technical requirements, building wireframes, and updating the design. Given the green light, Drupal Connect's developers worked on the build,. Not long after, BloomNet called and changed the direction of the project having taken a look at their rivals’ sites, they decided they needed something to outshine their competitors. The challenge then became to revert some of the changes the Drupal Connect team had made and implement some of the other features BloomNet had added to their wishlist. With a bit of an overhaul, Drupal Connect was successfully able to build a site that truly demonstrates BloomNet's competitive advantage in the marketplace.